Did you know that the humble Bramble has long been used in folk medicine all over the world for its amazing ability to help cure a variety of common ailments? Not only delicious berries but also the leaves and roots of the blackberry bush have been found to speed up the healing process of infections internally and externally. Blackberry leaves are known to contain a significant amount of vitamins, especially vitamin C, and minerals, such as calcium, magnesium, phosphorus and potassium – all vital to the body’s proper functioning. Some of the active constituents in blackberry leaves are derivatives of kaempherol and quercetin, one of the most powerful antioxidants in nature. Besides bearing highly nutritious fruit, blackberries possess nutritional value themselves offering amazing health benefits to the whole body. Blackberry leaf tea has been long used to heal mouth sores and inflamed throats, and it is a first “to go to” plant when upset tummies cause trouble either at home or on the road. To make a mild blackberry leaf tisane, use about 1 tablespoon of dried leaves to 1 cup ratio. Pour boiling water over the leaves and let them infuse for 3-5 minutes. Strain, add honey to taste, and enjoy either hot or as a cold, refreshing tonic. Note: Even hot blackberry leaf tisane has a pleasant, cooling effect on body. To make a strong blackberry leaf decoction for medicinal purposes, boil 2 tablespoons of dried leaves as well as a couple of pieces of stems (the hard, woody stems are best) in a quart of water for 1-2 minutes. Turn off the heat and steep the herb for 10 minutes. Strain and drink as hot as possible. Note: Strong blackberry decoction is a powerful astringent with an intense, bitter taste that brings on a sweet aftertaste. Blackberry decoction induces perspiring and is known to help cool down a feverish body. Blackberry leaves have a wonderful application in skin care due to their antibacterial and anti-inflammatory properties and high count of tannins. Tannins as astringents play an important role in wound healing, hence, blackberry leaves are extra helpful when rapid wound closure is essential. Blackberry leaves make an exceptional skin tonic which not only shrinks pores and diminishes the appearance of fine lines and wrinkles, but also deeply energizes and tones the tissues. Blackberry leaves can be effectively used to treat skin rashes and acne sores, too. Rich in flavonoids and vitamins, strongly astringent blackberry leaf aids in relieving the skin from irritations and inflammations, effectively addressing the issues with overproduction of sebum and acne scar forming. As a potent antioxidant, blackberry leaves are used to treat and protect the skin from the free radical formation that induces premature cell death and rapid aging as a result. With regular application of blackberry leaf infusion the skin regains its natural radiance and tone; therefore, we recommend including the blackberry leaves in your daily beauty regimen! Learn more about MinErbs TONING FACE MIST with our Wild-harvested Blackberry Leaf-Infusion! Thank you so much for taking the time to stop by and read our journal! Please feel free to leave us a comment below + don't forget to sign up for our newsletter below to be notified when we share again! Sign up to receive updates on our next educational post, DIY project or special announcements! *These statements have not been evaluated by the Food and Drug and Drug Administration. This product is not intended to diagnose, cure, treat, or prevent any disease. "Which one of your products would be best for my baby's dry skin?" This is one of the most common questions we receive from you Mamas out there! We decided to create a space here in our online home to share powerful tools for your family's wellbeing and the answers to your most important questions! It is our mission and passion to help educate you on the different types of products available and their unique benefits! We want you, as parents and guardians, to have the knowledge necessary to make the most educated choices for your children! Seeing dry or peeling skin on newborns is common as the baby's delicate skin responds greatly to environmental variables! It is not always possible to address the issues before redness or a hot rash develops; therefore, we make it a priority and take it very personally when creating the right tools for our own as well as your precious little ones! TO MAINTAIN HEALTHY SKIN, PROVIDE NUTRIENTS & LIGHT MOISTURE - The best way to prevent skin dryness as well as maintain the baby's healthy skin is to moisturize it often, especially after washing. Baby Oil is suitable for moisturizing right after a bath as the pores are open and readily receive the nutrients and minerals carried by the oil. Application of the oil is a wonderful defense mechanism against mentioned environmental variables! Baby Oil also makes for a wonderful post-bath or pre-bedtime soothing massage routine for your little ones! 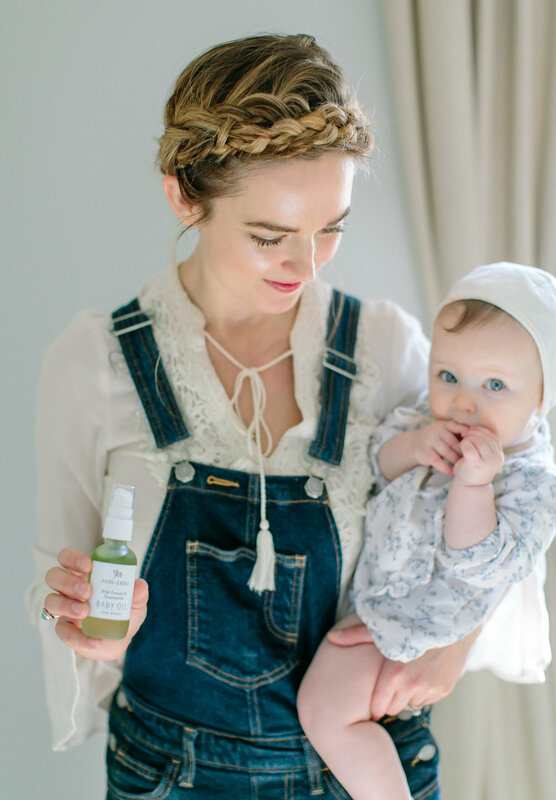 Our Wild Fennel & Chamomile Baby Massage Oil is created with our signature wild-harvested fennel, paired with soothing organic chamomile to make an exceptional infusion that leaves the skin nurtured and soft without leaving greasy residue! FOR DEEPER HYDRATION & COMPROMISED SKIN - Butter is a perfect choice when the skin needs a little extra moisture! When the skin is already compromised and may be dry, red, flaky or peeling. Butter typically melts on contact with skin and absorbs into the skin a little slower than baby oil. Butter brings much deeper hydration to the dry skin and is a good choice when there is concern of breakage or roughness of the skin. Our Wild Fennel & Chamomile Baby Butter is created with nutrient-dense oils & butters such as Calendula extract, which speeds up the healing process, and Chamomile Butter, to soothe and calm the skin. Gentle enough for even the most sensitive skin! FOR EXTRA HEALING & A PROTECTIVE COATING - Balm is typically best to help soothe “hot spots” on the skin, such as inflammations and rashes. While great at moisturizing also, Balm creates more of a protective barrier, addressing the irritations and coating the skin much more than butter or oil does! Our soothing, versatile Blue Chamomile Baby Balm is rich in minerals and vitamins essential for healthy skin. The combination of herbs known to alleviate redness and hot spots include our favorite Chamomile German, which gives it a lovely natural scent and beautiful bluish hue. Healing Calendula extract and Aloe Vera ensure the areas prone to rashes stay healthy and clean! P.S. Our Blue Chamomile Baby Balm is a personal favorite for diaper rash! We are so blessed to have worked with the talented photographers for the lovely images you have seen here! Thank you to Jennifer Blair, Laura Nelson & Ellie Koleen for your incredible images! 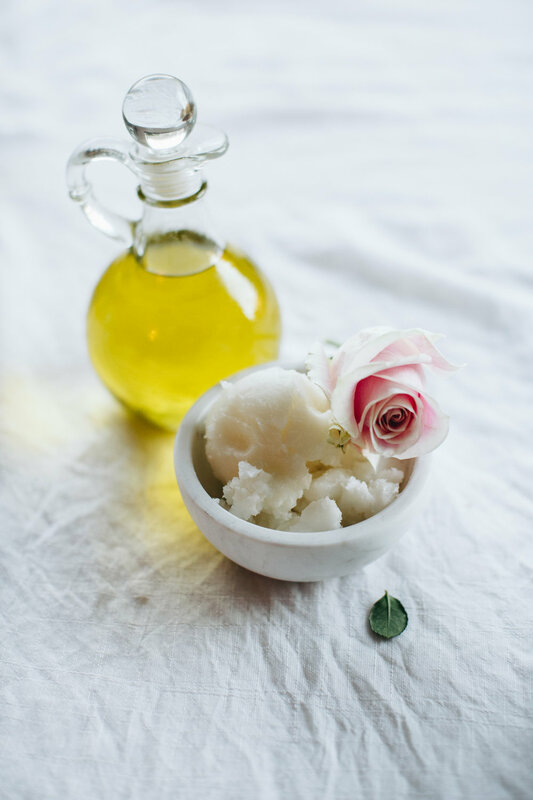 Our DIY Body Polish is the perfect way to put your lovey Valentines Day roses to good use after they are no longer fit for the kitchen table! + This is a great project to do with your kiddos! My 5-year-old daughter did the whole process on her own while I snapped the photos. The Rose has long been prized for not only its beauty and exquisite fragrance, but also for its strong medicinal properties. Known as a powerful astringent, the Rose is used in crafting various toners, creams and facial washes that address an array of complexion issues! It is a precious ingredient to help soothe and tone the skin as well as help fight skin issues such as acne, eczema, irritations, scars, inflammations, etc. The tender and delicate Rose is loaded with vitamins and potent antioxidants essential to healthy skin. The therapeutic benefits of Rose go beyond just delivering a beautiful, radiant skin; the whole body benefits from this beautiful flower. Rose is calming and energizing at the same time, bringing a sense of freshness and harmony to the whole body. Sprinkle sugar on top of the petals to fill the jar. Pour your carrier oil (jojoba, flaxseed, sweet almond, olive oil out of your cupboard, etc.) on top of the sugar. Wait for the oil to saturate the mixture completely. Top it off with more sugar, if needed. We personally prefer the natural smell of the sugar, coconut oil, and roses! If you prefer more scent, you could add 1-3 drops of your favorite essential oil to the carrier oil! Close the lid and let the sugar & petals absorb the oil for a day or two. Store your body polish in a cool dry place! If you do not use your polish all at once, make sure to keep any moisture out of the container. There are no artificial preservative added, so if any moisture is introduced to the container, it can cause bacteria growth. Try your Natural + Homemade Body Polish! When ready to use, thoroughly mix the contents. Use as a body polish to exfoliate, soften and moisturize your skin! Please be careful when using your polish in the bath or shower! Oils can cause the tub or floor to become slippery. Don't have any Rose Petals? That's alright! Try a parsley or kale body polish for a powerful mineral boost! Just use the same steps as above! Use the same steps as above, but replace the rose petals with ground oatmeal! (All you need is a coffee or spice grinder to grind the oats!) We used calendula-infused apricot kernel oil for our Baby Rub! We will show you how to infuse oil for our next DIY! Be sure to sign up for our newsletter below to be notified. We hope this DIY Body Polish is a blessing to your family! Let us know what you think in the comments below.